Rep. Hermilando Mandanas of Batangas was a long time political ally of President Benigno “Noynoy” Aquino III and the chairman of the Ways and Means Committee until he defied his party’s stand in the contentious impeachment case of then Supreme Court Justice Renato Corona in December, last year. For refusing to sign the impeachment complaint against Corona, Congressman Mandanas claimed that he was stripped of the chairmanship of ways and means as well as the vice chairmanship of the economic affairs panel. He later resigned from the president-led Liberal Party. 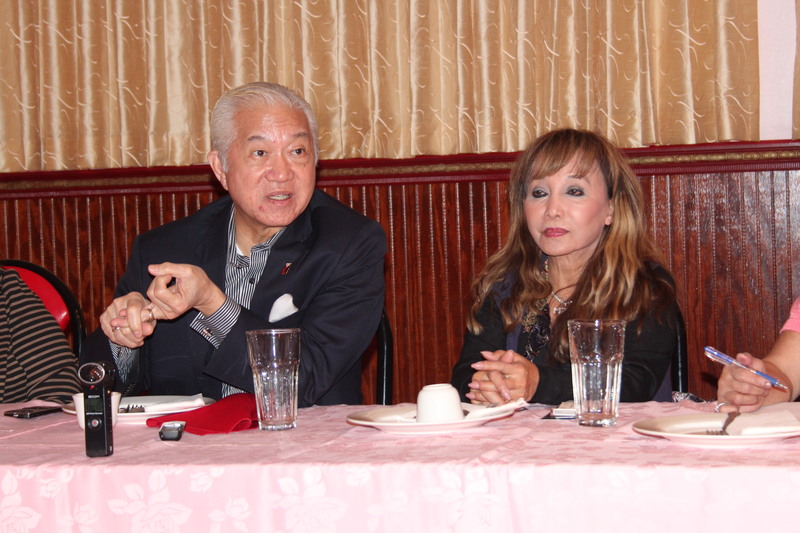 The three-term representative of the 2nd District of Batangas (he was also a three-term governor of the same province) narrated his version of that incident when he guested a dinner-press conference on Tuesday, October 30, at the Mayflower Restaurant in Chinatown, Los Angeles. 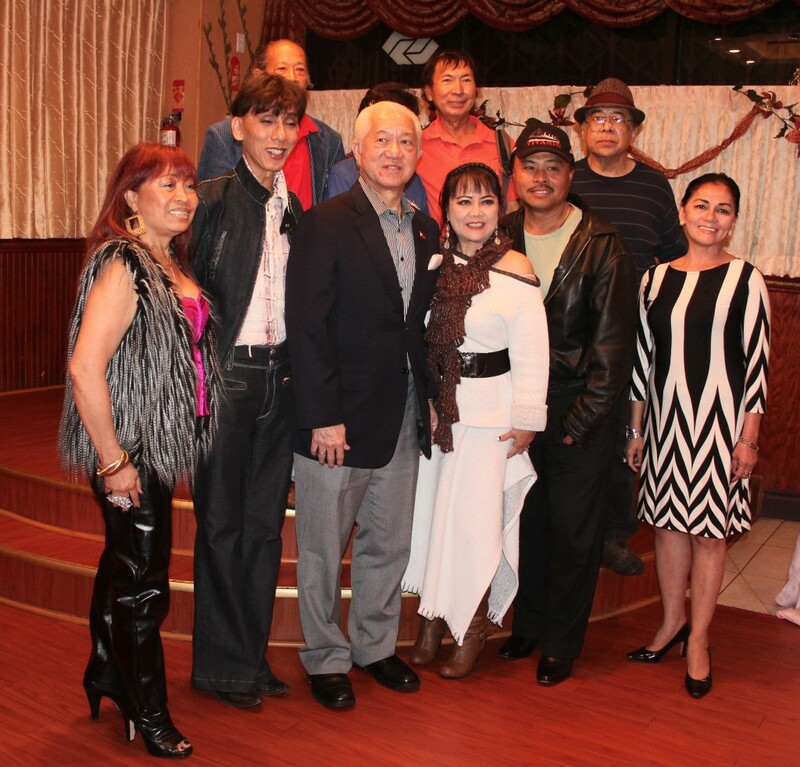 The evening event was hosted by the newly organized Filipino American Press Club of California headed by Thelma Calabio. Also in attendance were members of the Karilagan and the Skyline Lions Club. Mandanas traced his membership in the Liberal Party to year 2004 when there were only 16 of them including then Congressman Noynoy Aquino. Their group figured in an unsuccessful attempt to impeach then President Gloria Macapagal Arroyo. When the 2007 election came he was the only member of the Liberal Party in Batangas province and was the only one who campaigned for Aquino in his bid for a seat in Senate. “Of course in 2010 there were already many who joined the Liberal Party when Noynoy ran for President and won… especially after we won, ha. So that’s why I became Chairman of the Ways and Means Committee. I chose that because I’m an investment banker and a CPA by profession,” said Mandanas. Regarding the conflict with his fellow party members later on, Congressman Mandanas alleged that he did not sign the impeachment complaint against Corona as a matter of principle and because it is a violation of procedure for him to sign a document without being able to read it first. He explained that what was presented to them was only the signature page that includes the space where to sign the oath. By signing “you swear to God that they are true, and that you have already appreciated the evidence,” he said. Of course, he didn’t sign, he said, and subsequently was told by the Majority Leader that “hey…if you sign kasama ka ni PNoy, pag di ka pumirma kalaban ka ni PNoy.” (Hey… if you sign you are with PNoy otherwise you will be considered an enemy of PNoy.) Like Mandanas the former chief justice is from the same province of Batangas. Gonzales II also said that Mandanas had been advocating issues contrary to the position of the party, such as his call that local government units should have a share in the Internal Revenue Allotment (IRA) from earnings collected by the Bureau of Customs. On the IRA issue, Mandanas had this to say: “I saw that there is a portion of the collection of national taxes which according to the Constitution and to law should go to the local governments, the barangays, to the municipalities, cities, and the provinces.” What’s happening is that such portion is being used for national projects. That amounts to misappropriation of funds, said Mandanas. Mandanas informed that when he was still Governor, he sued in the Supreme Court the administration of Gloria Macapagal Arroyo and won P60 Billion for the provinces, barangays and cities. The amount was used to improve education, health and local projects. When he became chair of ways and means, Mandanas reportedly found out that the irregularity is still prevalent in the Noynoy government. Worse, there were accumulated amounts that goes back to the administrations of Presidents Fidel Ramos, Joseph Estrada and Macapagal-Arroyo. Instead, the current administration told him to get used to it already. One month after he was replaced in the Ways and Means Committee he sued the Aquino administration for P150 billion. The case is pending in the Supreme Court, he said. Mandanas also criticized President Aquino’s “Matuwid na daan” concept of government saying that governance is not only a matter of fighting graft and corruption. The president should have development programs and the six “Cs:” That means Aquino should not only be clean but competent, committed, compassionate and have courage and character as well. 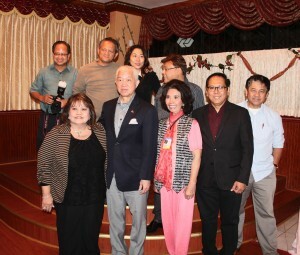 It may be noted that the previous issue of PinoyWatchDog carried a story about a community forum at the Philippine Consulate General where Congressman Mandanas joined Deputy Consul General Daniel R. Espiritu and Vice Consul John G. Reyes in a discussion about voter registration and dual citizenship with community leaders and members of the press. However, in terms of the number of voters, we still are not a factor in California because of the low percentage of our voters, Mandanas said. “Here in California even if you include the ones in Washington or Arizona all the way out to Texas, you just have about 50,000 registered.” That’s what he was told by the personnel of the Consulate in LA and also in San Francisco, he said. On the other hand, he conceded that it is really difficult to register and vote in our election system compared to that of the U.S. Additionally, election day here is not a holiday unlike in the Philippines where it’s almost the whole week. He also mentioned that even those already registered to vote here has very low turnout in the actual voting. Mandanas said that he will not be running for any office when his term ends next year. He is now the national treasurer of the United Nationalist Alliance composed of the PDP-Laban headed by Vice President Jejomar Binay and the party headed by former President Estrada and Senate President Juan Ponce Enrile, the Partido ng Masang Pilipino. There is the prospect of bringing to the U.S. Filipino candidates “to excite the Filipinos here,” Mandanas said. There is also a suggestion that Filipinos here should invest like fifty dollars each for the candidates’ expenses. “We’re considering to have attraction like Congressman Pacquiao who is with UNA incidentally,” he said. December 1 was mentioned as possible date for the candidates to come. Rep. Mandanas: “Yes, yes, that is a sound issue that is being discussed right now. Mandanas said that a politician is a different matter because he has already given up the right to privacy. A politician cannot sue you even if you call him a crook. He also touched on the issue of plagiarism; that in the Philippines is not a crime, only a civil liability.